Granting a power of attorney to someone else gives them considerable power over your finances and property. If there is abuse of this power, the victim of this abuse will often need help from government authorities or the courts to recover money, property or other assets. This webpage sheet advises victims, or those assisting a victim, about what can be done. The Donor is the person who authorizes someone else to act on their behalf under the authority of a power of attorney (they are also now called the ‘adult’). the donor loses decision-making capacity and cannot revoke the agent’s authority (to protect incapacitated donors who are no longer able to monitor their attorney and take action if abuse occurs – but not if the POA is ‘enduring’). An “Enduring Power of Attorney” is a POA that remains legally valid even if the donor loses the legal capacity to revoke the agent’s authority. This form of POA is a useful planning tool for those who want to plan for the possibility of incapacity. This may avoid the appointment of a legal guardian not of the person’s choosing. It is important that you choose someone you trust. 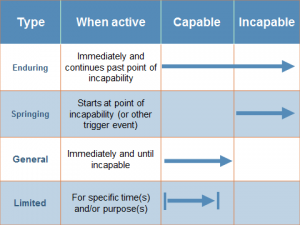 Incapacity is a legal test of decision-making ability from concerns that most typically arise from: mental illness; developmental disability; acquired brain injury; or, diseases associated with aging such as Alzheimer’s and dementia. A “Springing Power of Attorney” is a special kind of enduring POA that does not become effective when the donor signs it, unlike regular or enduring POA’s. Instead, it “springs” into effect at a later time or when a certain event specified in the POA occurs. Often this event will be the determination of incapacity of the donor. The Civil Justice System includes lawyers and courts that handle non-criminal cases. The Criminal Justice System includes law enforcement professionals, prosecutors, and criminal courts. POA abuse is the misuse by the attorney of the authority granted by the donor. It means making a decision or taking an action that is not in the donor’s best interest. An example would be when the attorney spends the donor’s money to benefit the attorney, rather than the donor, without permission. It may also include forging the donor’s name on the POA or coercing someone to make a POA against their wishes. Just like a trustee, or an agent of a movie star or professional athlete, the attorney under a POA has a legal duty to follow the direction of the person giving the authority, or to act as a fiduciary if the person can no longer direct them. Generally, this means that the attorney is required to act in a trustworthy manner, and to make decisions that are in the donor’s best interest, or that are consistent with the decisions that the donor had made for themselves before losing decision-making capacity. While an attorney will not receive payment for this assistance and may not benefit from their authority, they are required by law to maintain accurate banking and bookkeeping records, and be able to account for all the money and property they handle. Although their actions are not monitored, the Public Guardian and Trustee (“PG&T”) can demand an accounting if they receive a complaint of abuse of an incapacitated adult. NOTE – Under BC law, the attorney is only accountable personally to the donor, and to the PG&T if a demand is made. Even if the donor becomes incapacitated, the attorney is not required to account to other family members. It is not necessary to have a lawyer prepare a POA, but a lawyer may help POA abuse from occurring in the first place by writing a POA that limits the attorney’s authority or allows third parties to exercise some oversight of the attorney. See the article on Avoiding Elder Abuse by A Rogue Attorney – Kevin Smith – Scrivener Artic;le – Spring 2013 – written by one of our staff lawyers. Asking the court to declare the donor to be incapacitated and appoint a committee (guardian) under the Patients Property Act to make decisions on behalf of the donor or a monitor to oversee the attorney’s actions on behalf of the donor. The appointment of a committee, whether it is a family member or the PGT, cancels the POA. There are also specific provisions in the Criminal Code of Canada regarding abuses by trustees and attorneys under a POA. Police can be asked to investigate alleged criminal conduct by an attorney. Criminal justice professionals who are investigating or prosecuting POA abuse should take action to stop the attorney from spending or doing anything else with the donor’s remaining assets. Asset freezes might be possible. Additionally, prosecutors should ask criminal court judges to order the attorney to return stolen money, assets or other property to the donor – this is called restitution. Everyone is entitled to the least intrusive but most effective support. Using the manual version, you can print it out and mail or fax the completed form to the PGT Regional office in your area. Using the electronic form, you can fill it in online and submit via email. DISCLAIMER – This web page contains legal information, not legal advice. Every situation is different. You should see a lawyer for specific legal advice about your situation.